While Shibuya is very easy-to-learn, it isn’t so easy to put down once you get hooked by its charms. Shibuya by Nevercenter is game of never ending falling colored blocks. Empty slots fall from the top of the screen. From a random sequence of colors, tap the slots to create blocks which fall to a stack at the bottom of the screen. Tap two or more adjacent blocks of the same color in that stack, and they disappear while earning you points. The larger the grouping of blocks, the more points you earn. You can earn combo points by tapping on multiple sequences of blocks in a row. Combining Tetris-like blocks and "match-three" gameplay, Shibuya is an addictive puzzler. The interface if very clean, and the graphics are very elegant in their simplicity. All of the focus is on the gameplay with little to distract. Even the engaging music adds to an almost hypnotic effect of falling, glowing blocks. With both a quick-play and an endless mode along with multiple speed settings, there is plenty of challenge available. Also, collecting achievements will allow you to advance through different levels of the game. OpenFeint integration allows you to check your scores against others and show off your achievements. Shibuya is a solid puzzle game for those quick, spare moments. There are a few minor annoyances like no built-in instructions forcing you out of the game for help, and the game state isn’t saved upon exiting—make sure you finish that high scoring game or else you’ll lose your progress. Other than that, as the game says, “everything falls into place”. 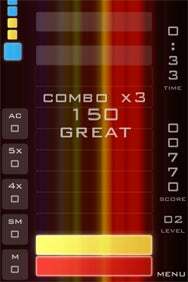 Shibuya is compatible with iPhone, iPod touch, and iPad running iPhone OS 2.0 or later.